Dave Campbell had a good year in 1977. In fact, on the back of this card, Dave Campbell is referred to as an “artist”: “Dave was the Braves’ top bullpen artist of 1977.” All things must pass. If Dave Campbell was called upon at the start of 1978 to continue being the team’s primary reliever, he didn’t last very long in the role and managed to record just one save the entire season. With the season underway, the Braves traded for Gene Garber, who would be one of the few bright spots for the 1978 team. Garber saved 22 games in all, and finished a team-high 36 games. Campbell was right behind him in the latter category, with 35 games finished, and it stands to reason that many of those 35 games finished were lost causes. Dave Campbell, former artist, had been demoted to mopup man. He didn’t pitch in many crucial situations, but because the Braves’ season had fewer such situations than a good or even a mediocre team, Campbell got plenty of chances to pitch, logging the second-most innings (after Garber) of any of the pitchers used strictly in relief. 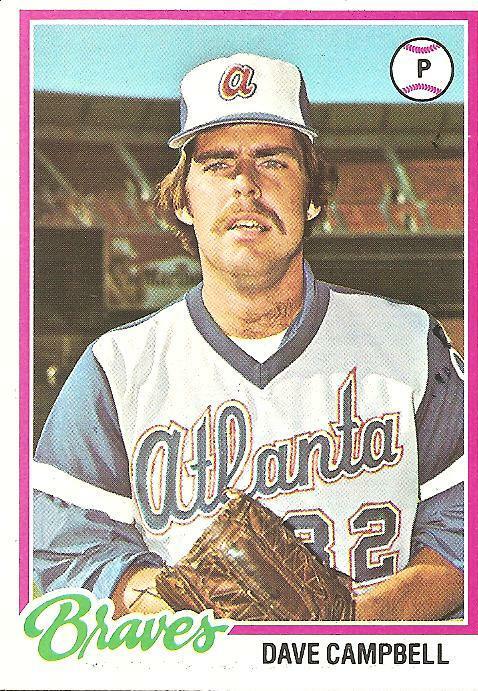 In the last game of the 1978 Braves, an extra-inning slugfest caused the team to cycle through most of their other bullpen options, including Gene Garber, and Dave Campbell entered the action in the thirteenth inning with the score tied. Dave Campbell seems to have been thrown off his game by the occurrence—he walked the next two batters and then hit a third with a pitch, loading the bases. He managed to escape the inning and prolong the season of the 1978 Atlanta Braves just a little longer, but we can’t really know how he did this. Once again, this time with Rick Auerbach up (Auerbach manning the third base position in place of Pete Rose, who like fellow legend Johnny Bench had exited the increasingly pointless action some innings earlier), the outcome of an at-bat is noted as “Batted Ball: Unknown.” Strangely, the efforts of Dan Dumoulin, the Reds pitcher who faced the Braves in the top of the fourteenth, are not similarly obscured, the play-by-play detailing how he danced around a Jerry Royster double by inducing a fly out to center and two groundballs back to the pitcher. But then when Dave Campbell retook the mound in the bottom of the fourteenth, the mysterious indifference returned, and this time it seemed to knock Dave Campbell completely off his axis. I try to envision the actual events of Dave Collins’ fourteenth inning at-bat against Dave Campbell, described in the play-by-play as “Batted Ball: Unknown” and all I can see is a ball looping up into the air above the fielders’ heads and then dissolving like a grayish pill in dark water. Eventually, another baseball is produced and given to Dave Campbell, but he has begun to sense what we all suspect eventually. The universe is infinite, this earth a speck that will one day dissolve, taking with it everything: bat, ball, gloves, sod, scoresheets, pencils, voices, memories, wins, losses, saves. Who can blame Dave Campbell for coming unglued? He gave up a single to Ron Oester and then, with the last pitch he ever threw in the majors, surrendered a George Foster home run. You are currently browsing the archives for the Dave Campbell category.